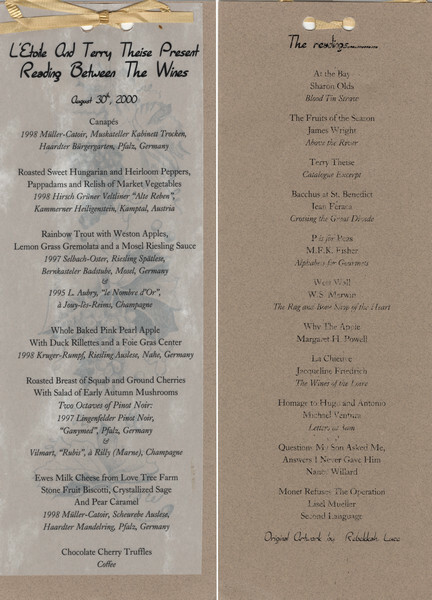 Front and back of menu from a Reading Between the Wines dinner at L'Etoile Restaurant, with a translucent overlay with the menu listing and a backing card with an illustration by Rebekkah Luce of grapes and grape leaves. Original loaned for scanning. For other menus from L'Etoile Restaurant, see also Image IDs: 103786, 103788, 103789, 103791, 104540, 107411-107416, 107419-107421, 107425-107426, 107528, 108572, 108576, and 108921.